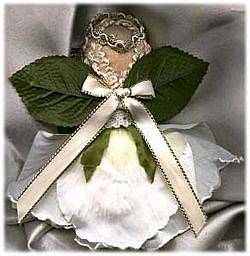 Here’s how to make a silk or synthetic rose into a pretty rose angel craft project. I have included a back view of the angel for you to determine placement of the wings and ribbon. Refer to the photos often while completing this project. Choose a pretty rose. This rose has a snow edge around all the petals, making it much prettier. You only need a single rose, so choose one that is extra special. You are not restricted to roses for this little angel either. You can use any flower bud that will serve as a skirt. Cut your rose stem with wire cutters, just below (about 1/4 inch) the base of the rose. You need that little piece of stem to hold your rose petals in place. Glue your doll pin (small side up) to the wood ball. The doll pin is her neck and the ball is her face. Glue your rose bud (where you cut) into the doll pin hole, pushing the rose up into the pin as far as you possibly can. be sure your rose is placed straight. Glue a piece of lace around the perimeter of the doll pin, with the seam at the back. Glue a piece of pearl beads around the top of the doll pin, keeping the join at the back. 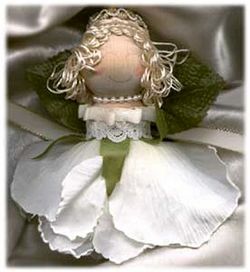 Glue a piece of decorative trim around the top of the head for hair (you can also us Spanish Moss, doll hair, yarn or similar item), making sure all your seams remain at the back of your angel. Cut a piece of gold ribbon or trim to make a halo and glue on the top of her head. Cut two leaves from the rose stem (these will be her wings). Position them at the back top of the doll pin and glue in place. Tie a small shoe lace style bow and glue to the centre of the wings at the back of the angel. Referring to the photo, paint a face using black marker for the eyes and diluted (with water) red acrylic paint for the cheeks. To dull the brightness of the marker, I gently sanded the marker area with a little fine grit sand paper.